With the contemporary buzz around innovation, the ideas behind Places of Invention could not be more timely. Building on twenty years of research by the Smithsonian’s Lemelson Center for the Study of Invention and Innovation, this book asks: Why does invention flourish in one spot but struggle in another, very similar location? Is it simply being at the right place at the right time, or is it more than that? How does place—whether physical, social, or cultural—support, constrain, and shape innovation? In short: Why there? Why then? Places of Invention, the companion book to the exhibition at the National Museum of American History, explores what can happen when the right mix of inventive people, ready resources, and inspiring surroundings come together and spark invention and innovation. 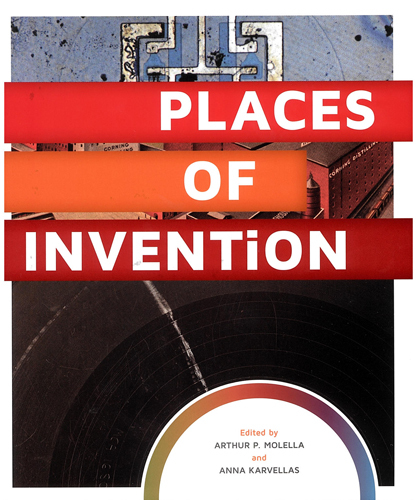 This lavishly illustrated volume examines current and historical conversation on the relationship between place and creativity, citing extensive scholarship and Lemelson Center investigation into the nature of invention and innovation. It dispels the myth of the lone inventor and shows that invention and innovation abound—not just in the Silicon Valleys of America but in hometowns across the country. Interspersed with these case studies are dispatches from three Places of Invention “learning labs” in Seattle, Washington, Peoria, Illinois, and Pittsburgh, Pennsylvania, where Smithsonian Affiliate museums and community partners are using Places of Invention as a model to document local invention and innovation. Here, Lemelson Center scholarship and public outreach converge to show how invention and innovation can be a transformative lens for understanding local history, cultivating creativity, and engaging communities. A foreword by Robert E. Simon Jr., founder of the planned community of Reston, Virginia, illuminates the importance of place and community in shaping creative spaces. A provocative closing essay by public historian Dr. Lorraine McConaghy suggests how other state and local institutions might connect past to present and create a road map for transforming local regions into vibrant places of invention.